I had a doctor's appointment today. I was also feeling unwell, but there was no direct correlation. I'd actually made the appointment in November, so it was a small miracle that I remembered to go at all. This particular doctor, who is actually a nurse practitioner, specializes in women's health issues, of which, if you are a woman, you know there are many. When she said, "In a nutshell, tell me why you are here," I almost laughed in her face. I had, in fact, spent the previous day and a half worrying about whether or not I could remember all the issues I have to tell her. 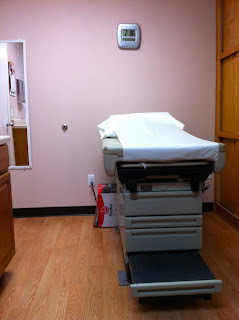 When I schedule an appointment with a doctor, I feel I should fax over a health memoir ahead of time. 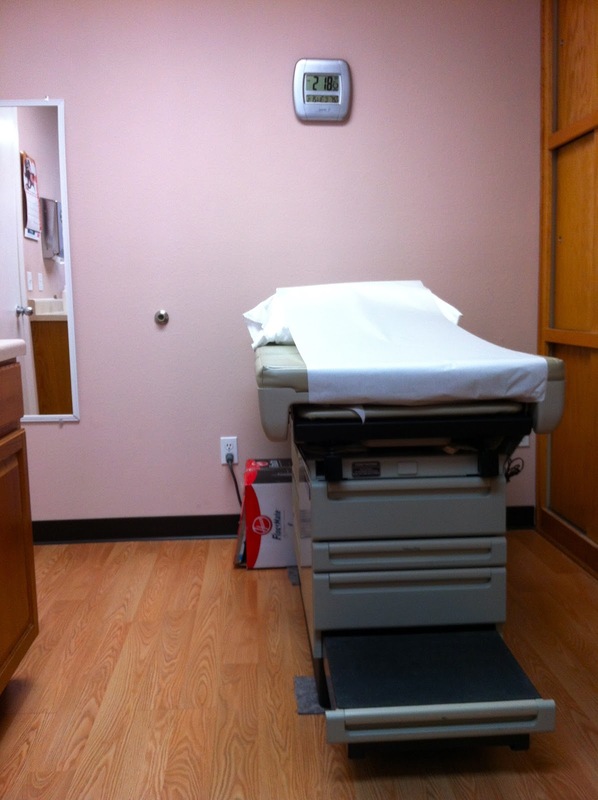 Sitting in the examination room waiting, I had time to recollect the countless times previous that I've waited on doctors, often clothed scantily in an over-sized medical frock. I think we don't use the word "frock" nearly enough. It sure is more fun than wearing one, anyway. You know the drill: first they take your blood pressure which, incidentally, they seem to prefer doing on your left arm, which always creates a humorously awkward musical chairs episode whenever I'm in the hot seat. I once had a nurse insist on taking blood from my left forearm before she finally actually looked up from her clipboard at me and saw that I didn't have a left forearm. I've learned to extend grace to medical professionals (they have to work all day under those fluorescent lights, after all), but my limb deformity is just the tip of the iceberg when it comes to comprehending my medical situation. These days I walk into hospitals with the excitement of a jaded doctor looking forward to another day of babysitting interns. This time, I was frock-less and fully clothed, thankfully. But the room was still sterile, both in decoration and instruments. There is something decidedly unfriendly about hazardous waste bins and tongue depressors keeping you company while you wait. It's not the first time being trapped in an examination room has inspired some goofiness. There is something about awaiting a health professional to size me up that puts me over the top, and I'm suddenly spewing sarcastic observations like I have one-liner turrets. Since I was alone this time, Finneas got top billing. 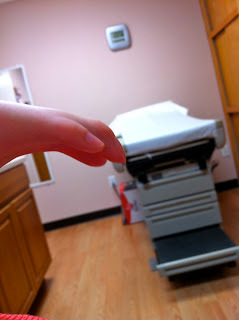 An examination room is an examination room, but an examination room with a tiny deformed arm appearing like King Kong's finger poking in––now that's an Alfred Hitchcock. But when she finally did arrive, it was surprisingly refreshing to learn that this particular physician was already surfing on my wave length. Our consultation felt more like a gossip session at the local beauty salon. I'd even brought coffee with me, for moral support. We giggled and talked about ignorant endocrinologists like a couple of nerdy med school students. She obviously had a huge crush on vitamin D. And she told me it was more healthy to drink heavy cream with coffee than half and half. I would now trust her with my life. I came out with a scroll of a blood test order. But I am confident that I will learn everything a 30-something woman needs to know about her body...just as soon as I find a lab that accepts blood by the half gallon. Yesterday, Mountain Guy gave me a Natalie Merchant album for Valentine's Day. When track two started to play, he said, "This is a song about you..."